Myrtle Beach has some of the most prominent Carolina Bays in the east coast of the United States. The bays in this region are also some of the most accessible because many roads and neighborhoods are close to well-preserved bays. The following description documents a three-day field trip to the Carolina Bays starting on the 4th of July, 2014. 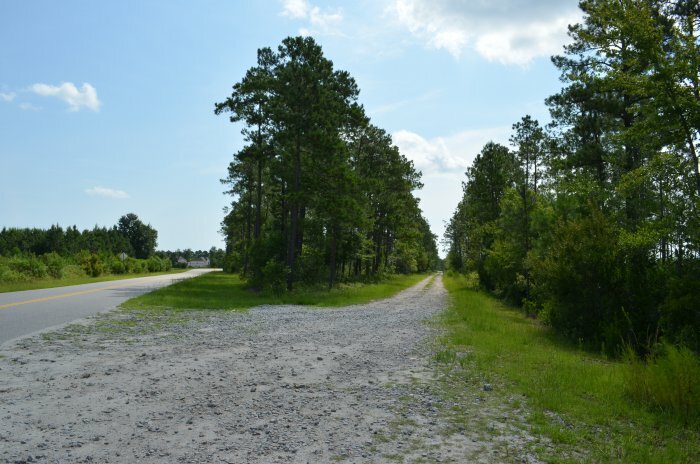 The area of interest is a rectangle bounded by highway US-501 (Edward E. Burroughs Highway) on the west, SC-90 on the north, SC-22 (Conway Bypass) on the east and SC-31 (Carolina Bays Parkway) on the south. 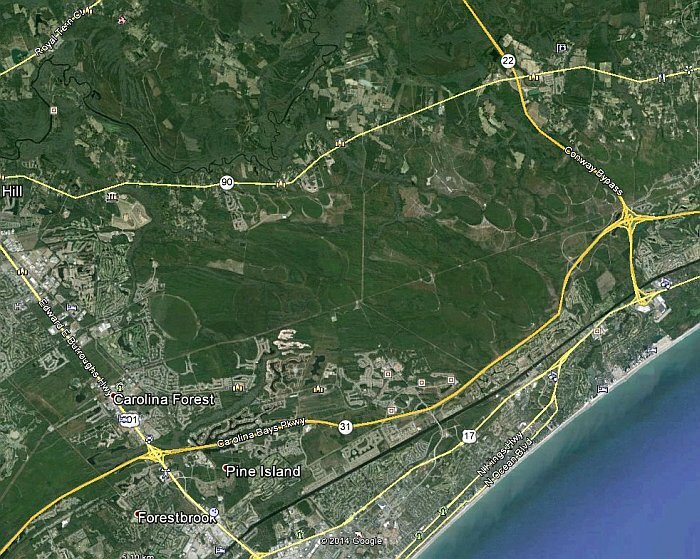 Almost any point in this area can be reached by car from Myrtle Beach within 30 minutes. The map from Google, above, shows the major roads in the area, including North Ocean Boulevard where many ocean-front hotels are located. In preparation for the trip, I loaded my Garmin GPS unit with the coordinates of some of the roads that I wanted to explore. 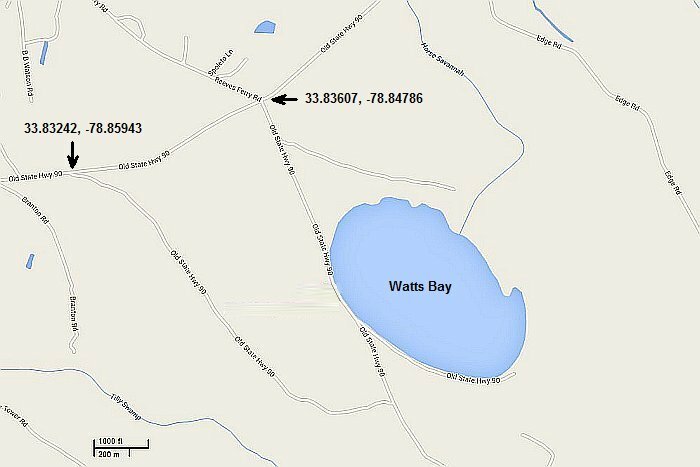 I was particularly interested in a branch of Old State Highway 90 that goes along the rim of Watts Bay. The Google map indicated the road dead-ending at the terminal end of the bay. I thought that this might be a good spot to take a soil sample. The names of the larger bays are recorded in the maps of the U.S. Geological Survey. 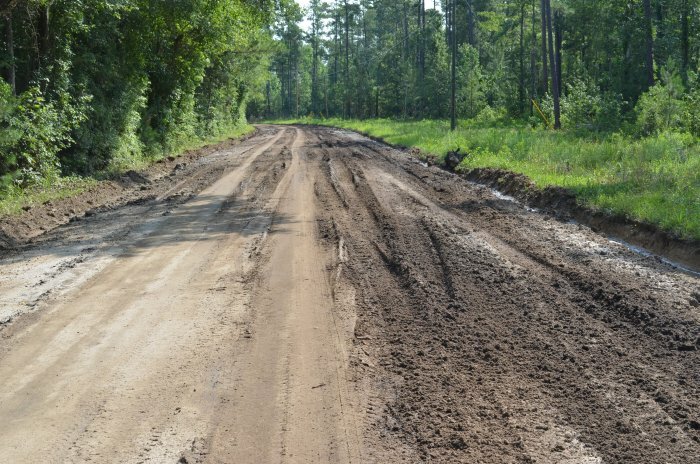 Old State Highway 90 is easy to miss because there are no signs marking it. 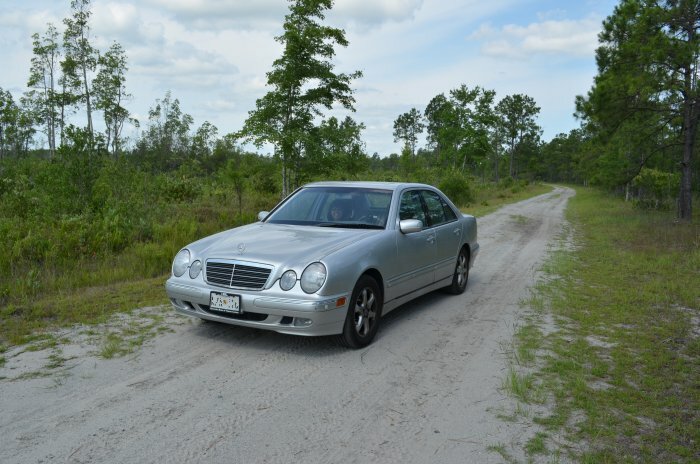 It was only through GPS navigation that I knew that the dirt road was Old State Highway 90. Soon after I got on this road, the GPS informed me that I was driving "off-road", although it still displayed the map. Hurricane Arthur had passed near the coast two days before. The road was still quite wet and the car skidded in some spots as it tried to get traction on the loose sandy soil. 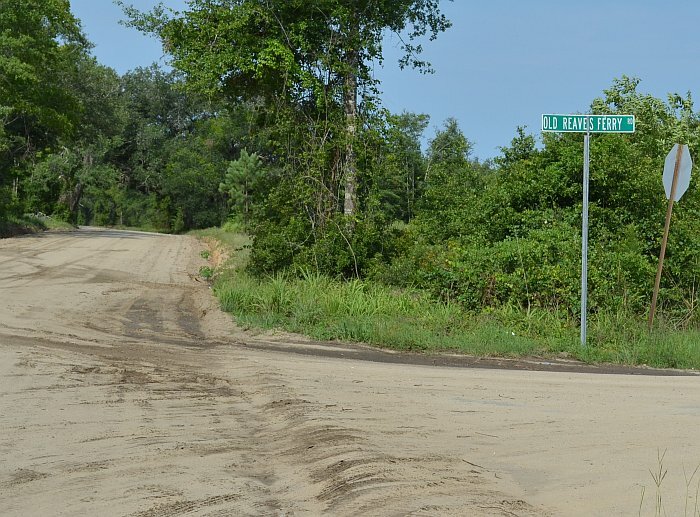 I reached my turning point by Reeves Ferry Road and discovered that the road that I planned to use was closed. 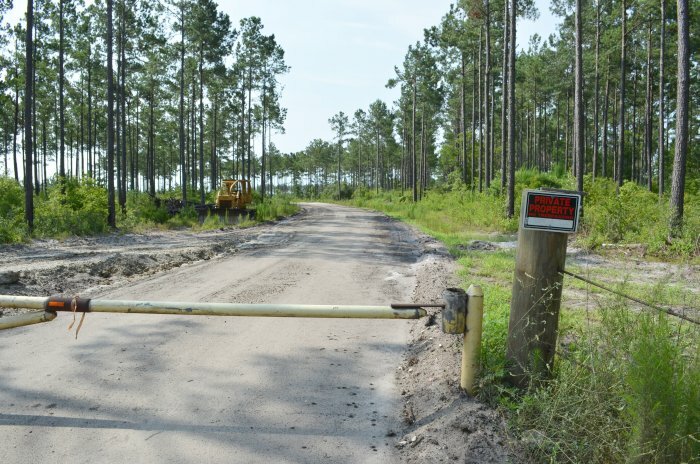 The Old State Highway 90 branch road that I wanted to use to go around the bay was closed with a cable, and a "No Trespassing" sign was posted. I continued west on Old State Highway 90 to a second branch near Branton Road. 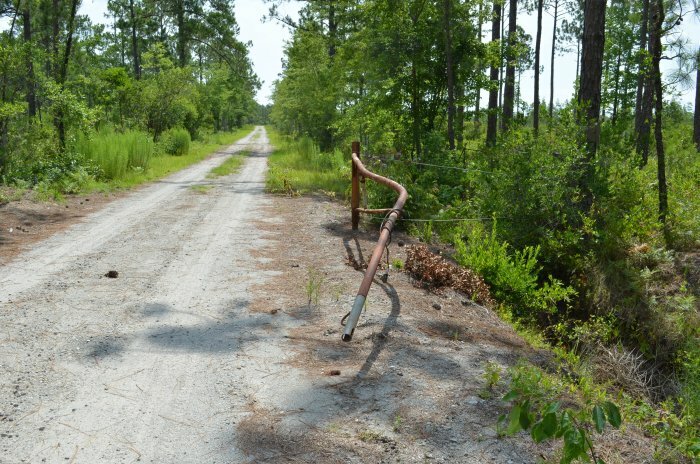 Old State Highway 90 branch near Branton Rd. 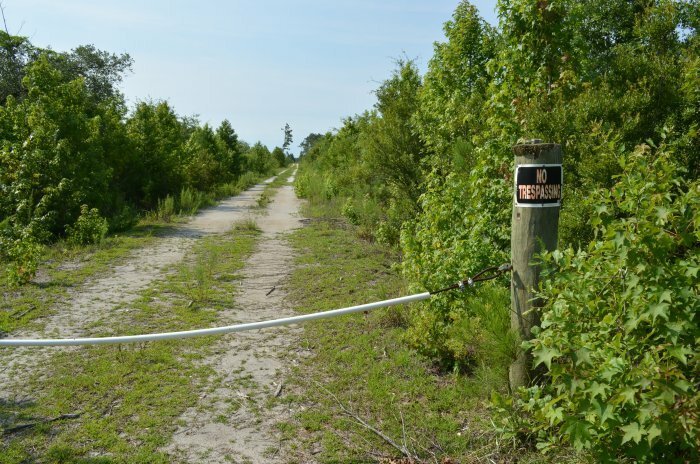 The Old State Highway 90 branch near Branton road was also closed with a sign that said "Private Property - no trespassing". Obviously, it was not going to be possible to use these old highway branches to explore this Carolina Bay. Power lines along Old State Highway 90 branch near Branton Rd. Fortunately, there was an electric power line easement crossing Old State Highway 90 branch near Branton Road. This was a place where it was possible to get a sample of the soil which is typical of where the Carolina Bays are found. 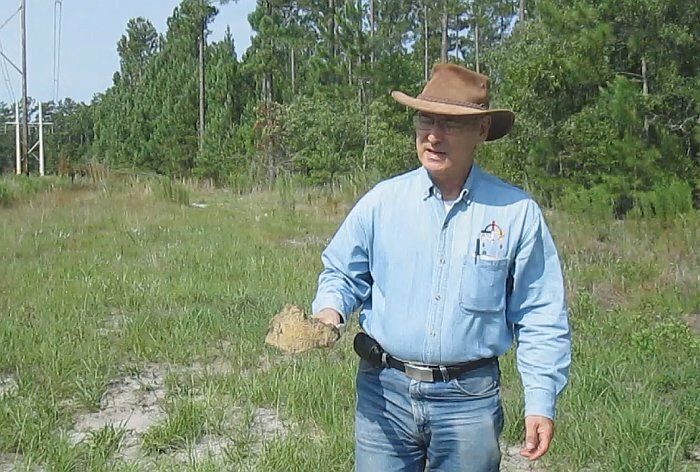 In this picture I am holding a shovel of soil typical of the Carolina Bays. The soil is moist and sandy; it does not have any cohesion. 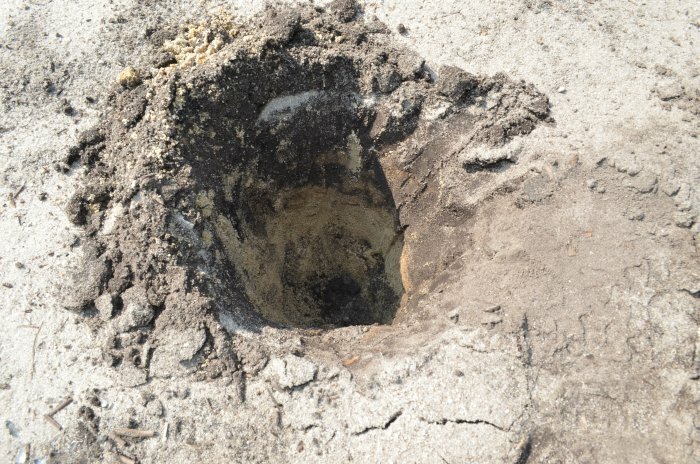 The structure of the soil is shown in this image of the hole from which a sample was taken. The top 10 centimeters have darker coloration of organic matter. The sand at a deeper level is similar to what would be found in a beach. 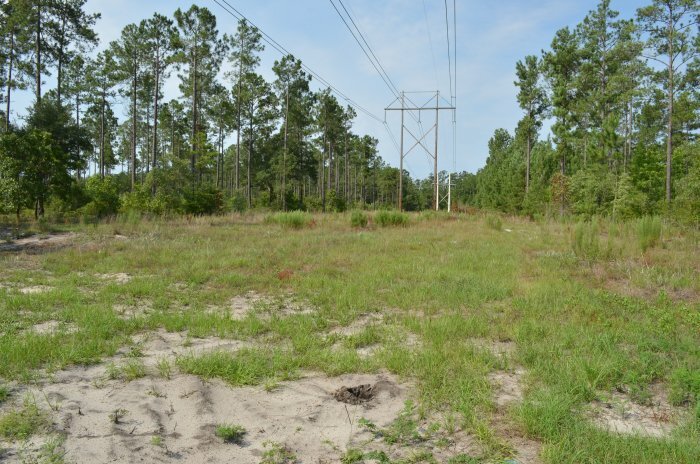 One question that we have to ask is whether the soil in this tract of land that has been cleared of vegetation for the easement of the power lines is representative of the soil of the bays. The answer is probably yes, since the removal of the vegetation disturbed only the top meter of the soil, but no extraneous soil was brought as filler. After I got home and I examined my photographs of the visit to Myrtle Beach, I noticed something that escaped my attention when I was in the field. I have been kicking myself for not having dug my shovel in the circle of smooth sand in the middle of the road. The picture above shows two such circles. Judging from the tire tracks, the circles have a harder surface. I think that they were created when subsurface water from the rains brought by hurricane Arthur bubbled up through the ground creating a quicksand pool that became a smooth sandy circle after the water level dropped. This may be another phenomenon besides viscous relaxation that could have leveled out the Carolina Bays. 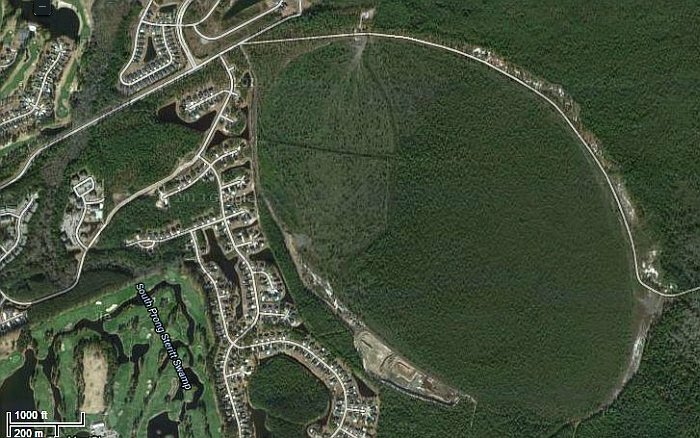 After having been thwarted from traveling along the edge of Watts Bay, I went back to Google maps and chose a new target bay near a residential neighborhood close to US-501. The Carolina Bay, called Cottonpatch Bay, centered at Lat. 33.781279 and Lon. 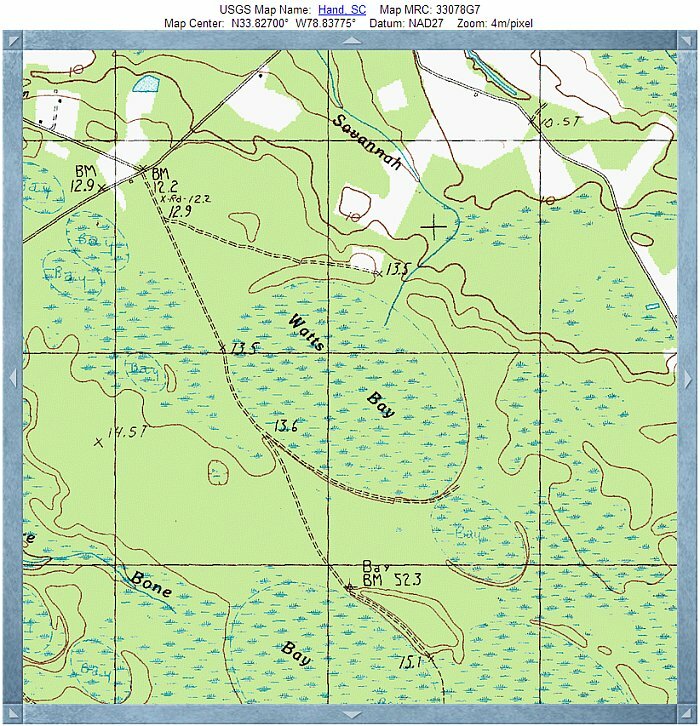 -78.944193 has a major axis of 1920 meters (6299 ft.) and a minor axis of 1175 meters (3855 ft.). The ratio of the minor to the major axis of 0.61 is close to the average for Carolina Bays. 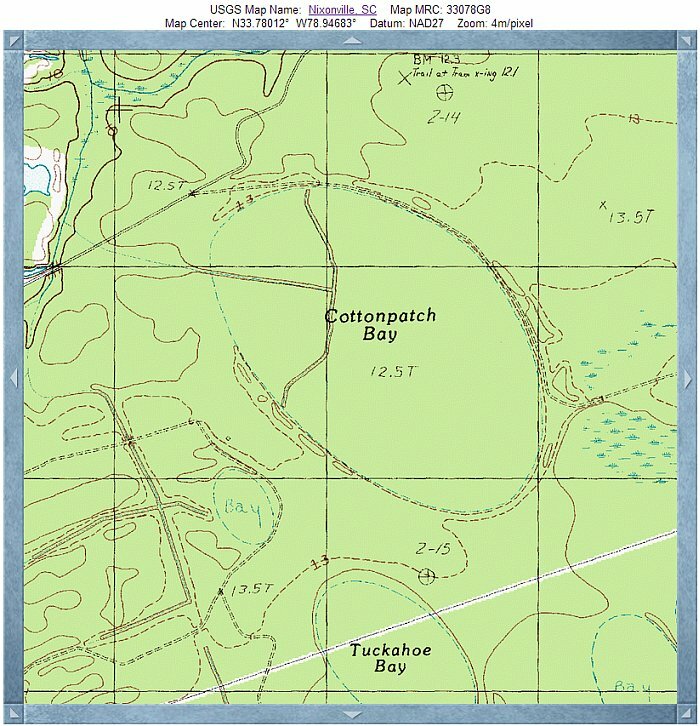 Cottonpatch Bay was chosen because it has a road along its perimeter. 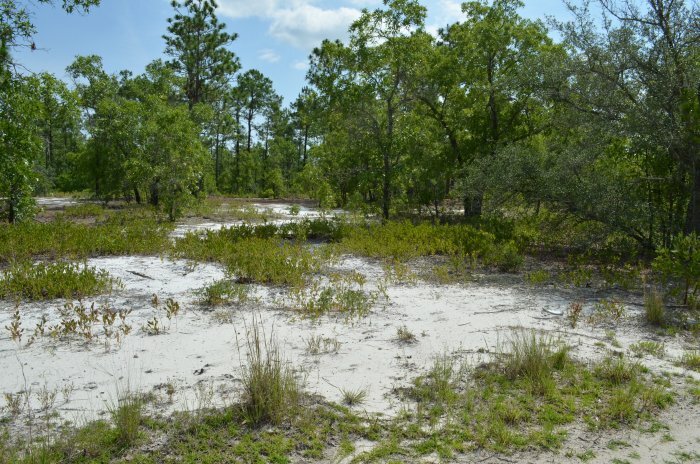 The South Prong Steritt Swamp is located just to the west of the bay. This provides an indication of how close the water table is to the surface. 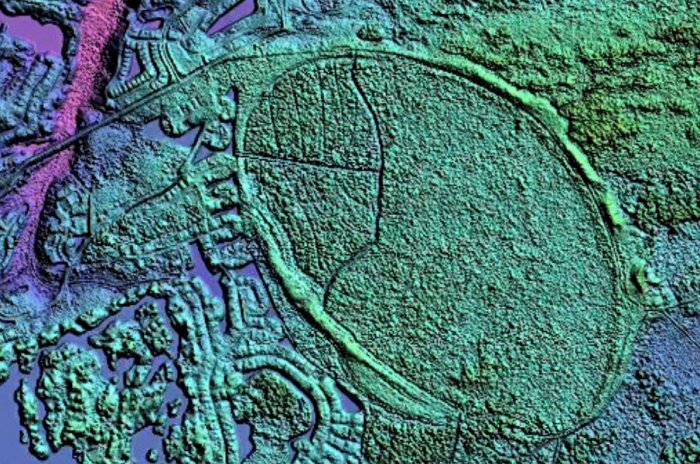 This LiDAR image shows the characteristic raised rims of a Carolina Bay. A grid of channels to drain the bay can be seen in the northwest portion of the ellipse. Eventually this land will be filled with rows of houses. Starting point for excursion along the rim of Cottonpatch Bay. Setting the GPS to 1599 Gardner Lacy Road, helped me to navigate to the intersection of Gardner Lacy Road and Carolina Forest Road which goes along the border of the bay. 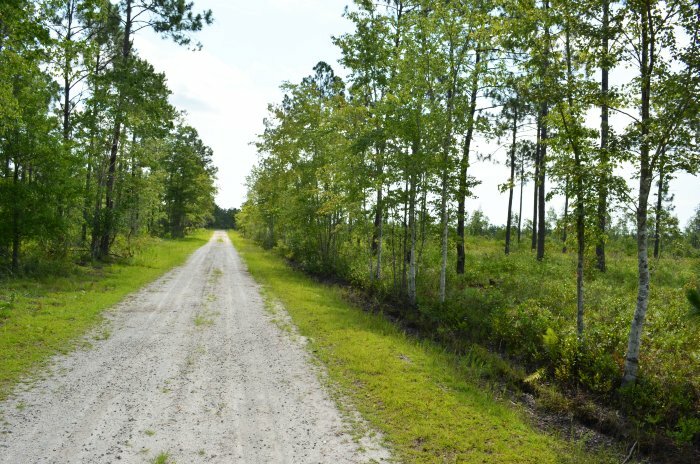 Carolina Forest Road starts out as a gravel road that eventually becomes just a sandy road. There is no sign of any kind marking the road. It can only be identified from GPS coordinates. Some distance from the start of the road, there was a gate, but it was open. The gate was curved, as if at some time in the past a vehicle had crashed into it trying to get out. 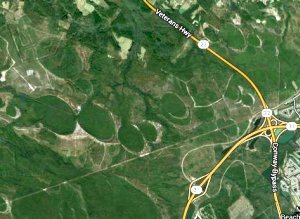 This road had no signs forbidding passage, so I drove along the single-lane road toward the bend shown in the map. The deep ditches along the road keep the road from flooding during rainy weather. This picture is typical of what a Carolina Bay looks like. The bay, to the right of the road, has a thick growth of vegetation consisting mostly of shrubs. Trees usually do not survive within the bays due to the wet soil conditions. The root systems of the dense vegetation have probably contributed to the preservation of the structure of the bays. 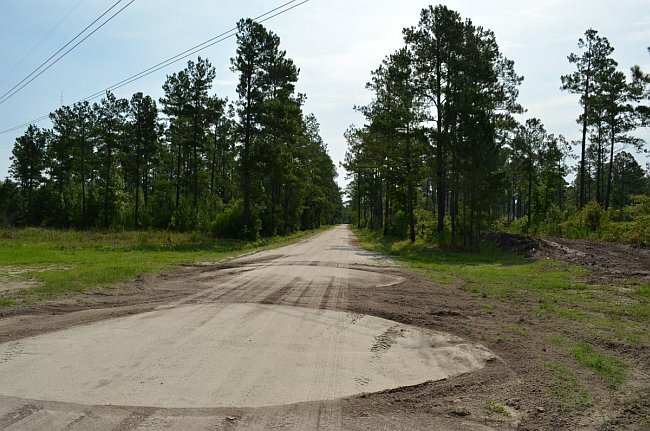 The sandy rim, to the left of the road, has mostly grass and trees. 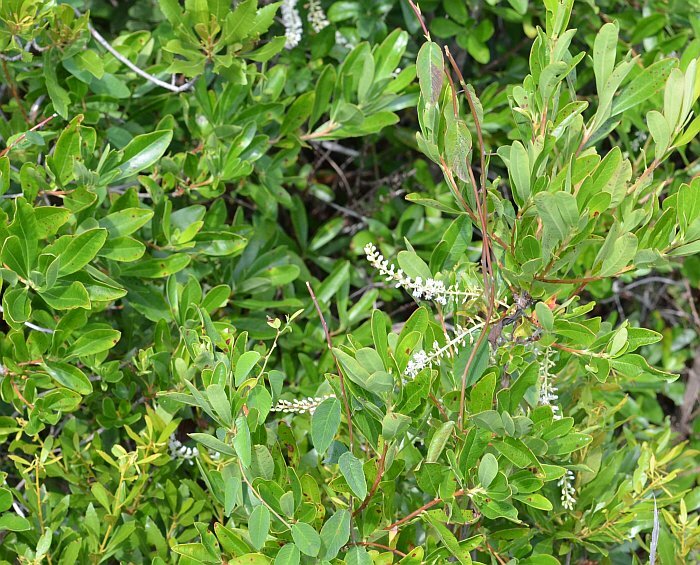 Bayberry bushes of the genus Myrica densely cover the Carolina Bays. Bayberry leaves and the waxy gray berries, which are the size of a peppercorns, have an aromatic scent that is used in candles, soaps and perfumery. The sandy rims of the bays are sparsely covered with grasses and trees. The poor soil does not support much vegetation. 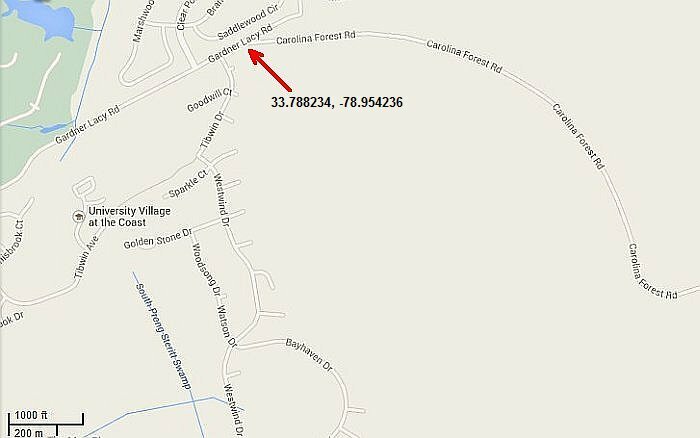 There was a bulldozer and a tank car parked at the bend of Carolina Forest Road. Although the road continued deeper into the woods, my car was not getting good traction on the soft ground. Carefully, I turned the car around and went back to enjoy some time at the beach. A 4-wheel drive vehicle would have been more appropriate for this excursion.